For years, multi-cultural people with hard to manage hair traveled from store to store, trying to blend products in a hopeless attempt to tame their locks. Wendi Levy and Kim Etheredge, two "mixed chicks", created a product line because they needed it. Then, something happened...friends and family started encouraging them to package it, and soon they had a full blown business running out of the garage. After a little door to door hustling, a few celebrity endorsements, and a ton of online customer support, MIXED CHICKS is bringing their products to the world. Whether you're black, white, asian, latin, mediterranean, or any glorious combination of the above, you'll love the way these non-sticky, lightweight curly hair products leave your hair inviting to touch as they define and lock moisture into every curl. Be a proud part of our multiracial movement..."Mixed Chicks" your curls! And yes, it not only works on wavy, tightly curled or straight hair but it also works on weaves. My daughter, Myelie has very curly hair. She is not of mixed race, but has inherited her father’s naturally curly hair. Actually his is very wirey. Ever since Myelie was a baby, I had always struggled with getting her curls under control. No matter how hard I tried or which products I used, her hair was nothing but tangled frizz. I thought I was going to go crazy! I could not even comb through it because she would scream. There did not seem to be any products on the market for curly hair, or at least a product that would help to combat frizz and define her curls so that they would look like cute little ringlets. Now that Myelie is older, she wears her hair past her shoulders, and it is easier to deal with than when she had thin baby hair, but we still have trouble finding products that help her define and embrace her curls. 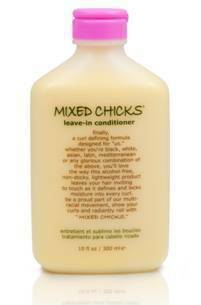 I was excited to be given the chance to review Mixed Chicks Leave-in Conditioner for Myelie! "10oz of the curl-defining formula designed for us. And when we say, "us", we mean many. Even if you are not mixed, you may have frizz and unruly curls, right? " Our Experience: Ever since Myelie has been using this product, she has been loving her hair. There was a time not so long ago that she hated her curls and would just stick her hair into a pony tail, or flat-iron it. After discovering Mixed Chicks Leave-in Conditioner, Myelie has been having many more good hair days than bad. Her curls look beautiful! I only wish I had the beautiful curls she has. Myelie is fianlly embracing her curls! In recognition of Breast Cancer awareness month Mixed Chicks packaged their infamous Leave- in Conditioner with a PINK cap. From every purchase of a 10 oz. bottle of leave-in conditioner $1.00 is being donated to Save the Ta-Tas Foundation for breast cancer research. Whether you are at work, working out or hanging with girlfriends, wherever you are, you are helping find a cure for breast cancer! when you purchase our 10oz leave-in this month. Mixed Chicks will be launching a new blogging series called the Your Hair Story Series and we would love to feature you.The series will explore the story behind your curls/hair texture and allow our customers/reviewers to give us new insight on themselves and how the Mixed Chicks products have impacted them. If you are interested in more information please feel free to follow up with this email for further instructions. I have studied at this Ecole Elgin market public school to complete my secondary education. It was one of the best schools in Grand Forks. I found this conditioner link in https://www.rushmyessays.org/ writing services and i have ordered it. At present, I am using it and its wonderful.